i’m still craving cake, cake and more cake! after last week’s chocolate fudge cake and given the beautiful sunshine we’ve intermittently been enjoying, i decided that something lighter was needed. 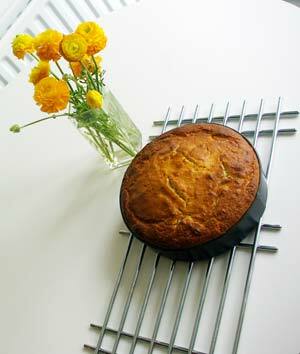 a friend recommended diana henry’s rose-drenched lime and yoghurt cake. this has similar flavours to my much-loved pistachio and orange cake with lemon rosewater icing but is much more delicate, both in flavour and texture, and i was glad that i’d upped the lime zest content of the cake itself. it’s incredibly moist, both because of the yoghurt and the lime and rosewater syrup which is poured over the still-warm cake and would be a lovely cake to serve after a meal. set oven to 180c and butter a 20cm spring form tin (i think you should line the base too as my cake was a little bit burnt on the bottom). put all the dry ingredients for the cake in a bowl and make a well in the centre. put the rest of the ingredients in the well and stir the mixture with a wooden spoon, gradually incorporating the wet ingredients into the dry. spoon the mixture into the tin and bake. after half an hour start checking if it is done. a skewer inserted into the middle should come out clean. be prepared for it take up to 20 minutes more, depending on your oven. leave the cake for 10 minutes to cool in the tin then turn out on to a plate. meanwhile, make the syrup by putting the water, sugar and lime juice into a saucepan. heat gently, stirring to help dissolve the sugar. bring to the boil and boil for 7 minutes. leave to cool and then add the rosewater. pierce the turned-out cake all over then slowly pour on the syrup while it is still warm. leave to soak in. dust with icing sugar before serving otherwise it sinks into the syrupy top. serve with berries and creme fraiche or yoghurt.